This is a highly contagious bacterial skin infection that affects infants and children. It usually appears as red sores on the face, mainly around the child's mouth and nose. Impetigo may clear on its own in about two to three weeks but antibiotics can probably shorten the course of the disease. The sores rupture and develop honey coloured crusts. One may contract the infection when he or she comes in contact with the sores of someone who is infected or with the items they've touched such as toys, clothing, bed linen and towels. • Red sores that quickly burst and then form a yellowish brown crust. A very serious form of Impetigo is called Ecthyma that penetrates deeper into the skin causing a more painful fluid or pus filled sore that eventually turns into deep ulcers. Older adults with diabetes or those with a compromised immune system are more likely to develop Ecthyma. 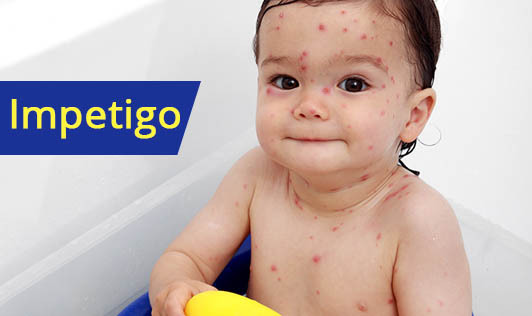 If you or your child has Impetigo, contact your doctor immediately!